Goodmans have really impressed me with their more recent products. The company has delivered both style and substance, something that many of their rivals can’t seem to manage. I recently reviewed the Goodmans Canvas, which is an excellent product offering great sound and functionality at a relatively low cost. 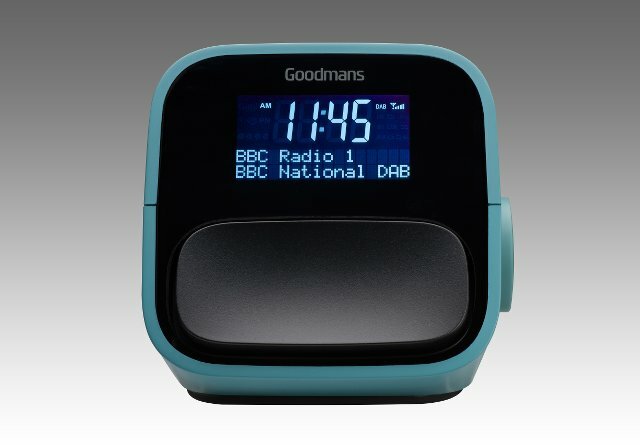 Interested to see how other DAB+ products fare, I’ve been living with the Goodmans NOD DAB+ Digital Clock Radio with USB Charging. The first thing that strikes you about the NOD is its small stature and neat design. It’s cubed shaped and comes in four colours – Coral, Light Teal, Concrete and Slate – giving plenty of choice and ensuring that it will fit in with your room decoration. On the right hand side of the NOD there is a dial control that is utilised for several functions including volume control, cycling through stations and setting the alarm. The setup is fairly straightforward. Once you’ve plugged the NOD in and pressed the ‘Power/Mode’ (which you can also use to switch between DAB, FM and Aux-in), the NOD auto scans for channels. You can manually search if you prefer but I found the auto scan to pick up all the channels that I wanted. You can preset the NOD to play your favourite station using the ‘Fav’ button, display station information using the ‘Info/Menu’ button and access the alarm wizard using ‘Alarm’. To be honest I found setting the alarm for the first time a little more fiddly than I would have perhaps liked. Once you press the ‘Alarm’ button you then use the dial to scroll through options. You can set the alarm’s volume and default sound (e.g. buzzer or DAB) and once you’ve scrolled through all of the options you need to press the ‘Alarm On/Off’ button to set it. It took me a few attempts, despite reading the user guide, and I found it a little frustrating. Fans of the snooze button will be pleased to know that the large button on the front makes it very easy for you to knock off the alarm for a period of time if you need those extra few minutes in bed. Similarly if you like to fall asleep listening to your radio you can use the ‘Sleep’ button to set a timer to automatically turn the radio off. A nice feature of the NOD is the dual USB charging functionality. On the back of the radio there are two USB slots allowing you to connect your smart phone or tablet to be charged. Granted you could just use a traditional smart phone/tablet power supply but if you’re short on plugs then plugging your devices straight into the back of the NOD is a nice perk. The NOD also allows you to connect headphones and there’s an aux-in slot to enable you to plug in your portable device and amplify the sound. Both are nice additional features, and whilst they may not be features you’ll use a lot, it’s great to have the option. The quality of the sound is really fantastic. Despite being such a little unit, the speaker on the top of the NOD is surprisingly powerful giving perfect clarity. The volume is plenty and actually the NOD gives audio that fills a room. It puts the memories of tinny early bedside radio alarm clocks to one side delivering a high quality that I wouldn’t have expected from a product such as this. One area of the NOD that could be improved is the front display. The area displays all the relevant information – time, radio station and track information, and indicators to let you know the alarm is active. It comes with three brightness settings, which can be cycled through using the large snooze button on the front. The problem I encountered is that unless the NOD was eye-level, it’s actually not that easy to make out the time in the middle of the night. Even on the brightest setting, which was too bright for me to able to sleep alongside, I couldn’t clearly make out the time. Instead I had to reach out of bed and tilt the radio so I was facing it straight on. 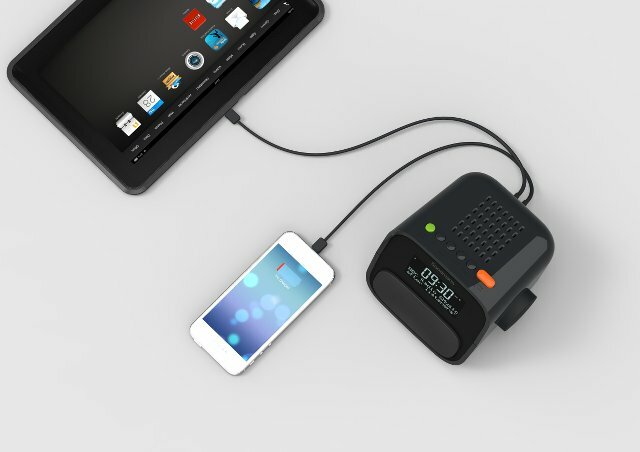 For the majority of people the NOD will do everything they need from a digital radio alarm clock and more. If you’re planning to perch it on your bedside unit, and it’s at eye level, you’re unlikely to have the gripe that I did. Overall the Goodmans NOD is a great product despite a couple of niggles, which you shouldn’t let put you off.